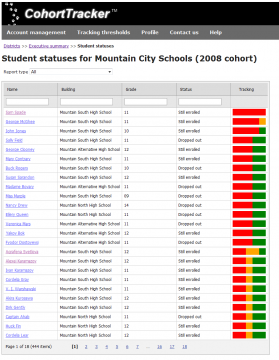 CohortTracker™ is an early warning system that allows school districts to track the real-time status of each active high school cohort (and every sub-group and individual within that cohort) vis-a-vis graduation from the moment of their enrollment. 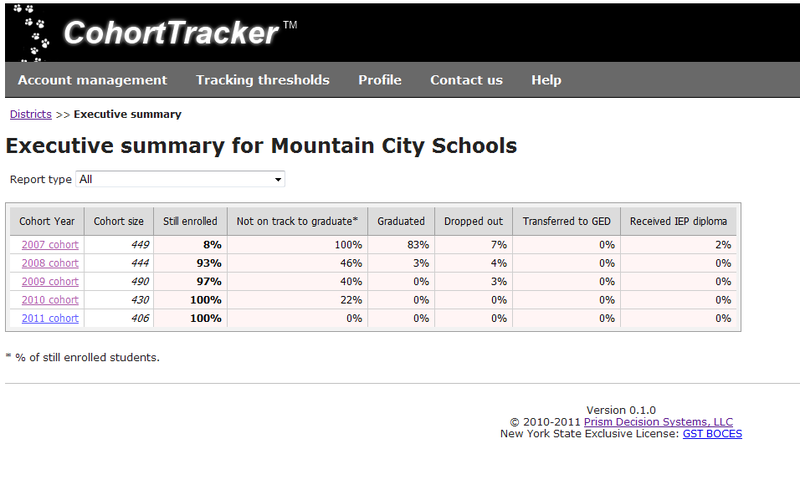 School district personnel using CohortTracker™ always have at their fingertips the information necessary to identify students who are lagging or seriously at-risk and to ensure their successful graduation. 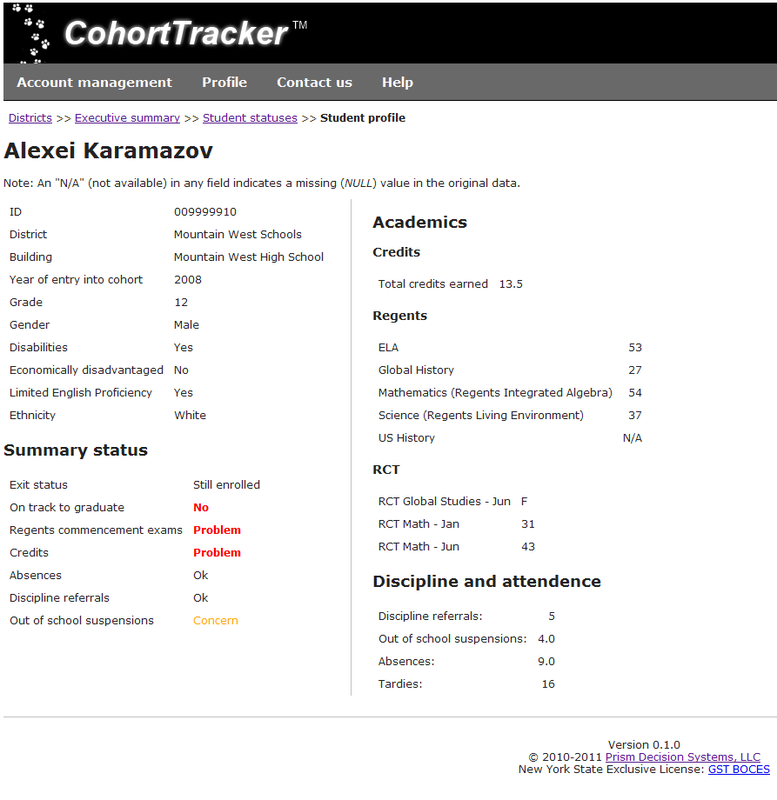 CohortTracker™ is designed to be a general-purpose student achievement tracking system that can be tailored to meet the specific needs of any education department. “CohortTracker™ is exactly the tool we need to monitor the graduation status of every student from the day of their enrollment in our secondary school system,” said Mary Kay Worth, superintendent of the Southern Cayuga Central School District. Adds Barbara Peters, Superintendent of the Elmsford Union Free School District: “We are very pleased to see that CohortTracker™ is available. We need a solution that quickly monitors the graduation status for all students so we can provide appropriate interventions targeted to individual student needs. The executive summary page lets superintendents, principals and guidance counselors know the current exit status of each enrolled cohort. Percentage of students who have graduated, dropped out, transferred to GED or received an IEP diploma. Predefined reports allow the user to filter the executive summary screen by exit status or by No Child Left Behind subgroup (i.e., students with disabilities, economically disadvantaged students, limited English proficient students or ethnic subgroups). By clicking on a cohort, a user advances to the student statuses page where the students are listed from most to least at risk. The most striking aspect of the student status page is the tracking column on the right of the table. The colored tracking indicators define performance in five areas: credits, Regents commencement exams, attendance, discipline referrals and out of school suspensions. For any student, red means there is a problem, amber is a warning that a problem might be developing and green means all is well. The colored tracking indicators are defined by a set of business rules that are customizable by school district. Any column can be sorted by clicking on its heading. Each column can also be filtered by typing text into the column’s filter box. 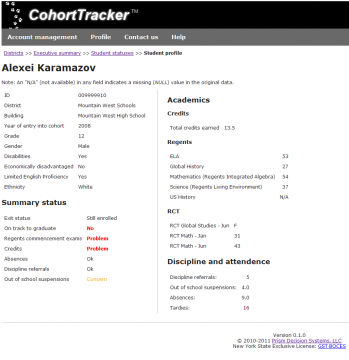 Because the data in CohortTracker™ is refreshed periodically, users will always have an up-to-date picture of how well or not their students are progressing vis-a-vis graduation. Available attendance, discipline referral, out of school suspension and tardy data. CohortTracker™ is a small app requiring small training that elegantly delivers big data to support big decisions. If you would like CohortTracker™ to be available in your state, province, region or district, contact Sean Brady ([email protected]) for more information today.